To describe Latora, my recipient of the $10 for today, what I would say in one word, is radiant. Her demeanor, her speaking, her vibe she was giving off, all just had that warm glow. I woke up to about 7 inches of fresh snow on the ground and the knowing I was going out in it to give away the $10. Always the multitasker, I was thinking I’d take a few pictures of this winter wonderland around as well and immediately thought of a favorite spot for doing just that. The Connecticut River runs through the state and makes for many wonderful photo opportunities, especially after a fresh snowfall. So I headed out to a local boat ramp in Rocky Hill where the CT River ferry also is located. The ferry doesn’t run and the boat ramp is closed in the winter, but it’s still a great place to park and get out a bit and take some pictures. Surely I’d find someone there to take the $10. No luck on finding someone though, so it was off to Plan B, another great place for pics, the Middletown Harbor. There’s always someone there. Again, no such luck, and so it was onto another option. I was heading to Office Depot to pick up something and there’s a Starbucks close by for a quick cup of coffee and hopefully I would find a willing person in either of those two places. Latora gave me this flyer for her church. I gave her my Kindness Investor card; we hugged and said we would connect again. I have left each recipient so far with a very nice feeling, but with Latora and her infectious effervescence, I found I couldn’t stop smiling for quite awhile afterwards. Day 363 – Meg P.
It was the Sunday before my Year of Giving Anniversary Celebration on December 14th and I was scrambling to get everything done that I needed to do. I had taken a break from my planning to meet up with a friend of mine who was visiting from Sao Paulo, Brazil. We went to Maggiano’s for lunch and on my way home I stopped by a small coffee shop near my apartment called Filter. Those who have followed the Year of Giving for a long time and have superpower memory might recall that I met Mark from Day 132 there as well. I was sitting there having an espresso scoping out the café. I really didn’t need a coffee, but I did need to find a recipient and given that it was raining outside I figured that finding someone indoors where it was dry and warm was much more appealing than talking to someone while becoming a human sponge. I grabbed a seat in the cozy café next to two young ladies who were sitting to my left. There are maybe 10 tables so often times you end up sharing a table with someone else. I didn’t know if they were together or just sharing a table, but figured I would ask the one sitting closest to me. It turned out they weren’t together and Meg, after pulling the earphones from her ears, agreed to accept my money. The other girl at some point seemed bothered by the conversation, or just bummed she didn’t get the ten bucks, and moved. Meg is a 23-year-old who lives in Takoma Park, MD and came into the city that afternoon to go to a “good coffee shop.” She was reading Wilkie Collins’ 19th century classic epistolary The Moonstone and listening to some music while she waited for her husband JD to arrive. Meg does some really amazing work. She works for an organization that helps resettle refugees from conflict areas such as Somalia, Sudan, DRC, Iraq, Pakistan, etc. “It’s very rewarding,” she said taking a sip of her latte. Meg and her husband got married this summer and moved here after having met at Oklahoma State University. Now a bunch of my relatives went to OU and I thought that this would be a good thing to mention. Little did I know that you don’t want to tell an Oklahoma State alum that you are partial to OU. We made quick treaty and she went on to tell me that she and her husband had spent time living abroad in Egypt and really enjoyed it. Having lived in Mexico, Spain and Brazil myself, I think the opportunity to live in another country, especially one where they speak another language, is extremely rewarding. JD arrived covered with beads of rain from the lingering afternoon drizzle. As it turns out he left his wallet in the car and asked Meg if she could buy him a coffee. Meg smiled and slid the ten dollars across the table to her husband. I’m starting to think that this city has too many law students. Ok, I guess it makes sense since Washington is our government’s central nervous system. But Molly was applying to law schools, Sarah from yesterday was in her third year of law school and today’s recipient is currently applying to law schools. Matt and I were seated in the two chairs just under the Starbucks sign. I found this fascinating. The fact that finding a dime could influence people’s behavior so much. Here I’ve been giving ten spots away, when people apparently would have been happy just getting a dime. It would have saved me $3,613.50 too! He told me about another study where if a subject was asked to donate money to a cause that they were much more likely to give if there was another person in the room. Now here is the fascinating part. The study also showed that the subjects were equally more likely to give if instead of the other person there was a poster of a robot prominently placed in the room. Weird. It’s like we do the “right thing” if we think others are watching. Even robots…painted on a poster! Interesting. Matt is originally from Michigan and plans to be here for about two years until he leaves for law school. “I like DC but I think I am going to go someplace else,” he told me. The 24-year-old works for the government right now and preferred that I not use his last initial or be photographed. Hmmm. CIA? Who knows? He was a nice guy though, smart too. I enjoyed chatting with him. In his follow-up email to me he told me that he gave his $10 to a guy who plays trumpet in the morning near the World Bank offices at 18th and G or K Streets. “He’s got a good heart,” he went on to write. My ex-girlfriend used to always talk about this guy. I went looking for him one morning but I couldn’t find him. Maybe I will try to find him in these remaining 9 days. Matt inspired me to do something too. He suggested I try to go talk to Arlen again. “Give her a second chance,” he suggested. I have seen her from time to time but have never talked to her again since our meeting when she was bitter and confused. I will try to approach her again. Thanks Matt for the encouragement. Day 228 – Kat B. & Ben A.
Today’s recipients are third year medical students at George Washington University Medical School. It seems that I have had a lot of recipients in the medical field over the last couple weeks. I was walking by SoHo Café on the corner of P and 22nd Street, which by the way if you live in DC you should definitely check this place out. They are really nice there and always take good care of you. Anyway, I saw a guy in front of the café holding a bottle of booze and thought that this guy is starting his weekend off with a bang! He turned out to be a rather bizarre individual. He was really paranoid or on some mind altering substance and became very nervous. Soon another individual approached him and he refused my Alexander Hamilton and walked away. I slowly turned in a circle, scanning the scene until I saw Kat and Ben sitting at an outside table at SoHo. They had laptops out and seemed to be working on a project (they were actually filling out rotation schedules) or something. I walked up to them and introduced myself and the Year of Giving. I asked them what they thought they might specialize in. They were still pretty open-minded about this and didn’t really have any decision made yet. “Not geriatrics or psychology” Ben said. Kat agreed. I asked them what they liked to do when they were not studying. “We live pretty boring lives,” Ben lamented. I felt bad about invading their time when he said “This is about the only time we have free.” But that didn’t stop me! No sir! Not me. Seriously, I tried not to keep them too long, but I did want to learn a little more about them. I found out that Kate loves to play soccer and has been playing since she was 4! She really enjoyed watching the World Cup this year. Ben shared that he did his undergraduate studies at Knox College, a small liberal arts school in Illinois. There he had a radio show for four years and later became the general manager. He also studied abroad in Copenhagen. I thought that was pretty impressive and then Kat added that she studied abroad in Spain (Salamanca) and spent some time in Switzerland and New Zealand where she jumped out of a perfectly good airplane! Pretty impressive. As I always do, I asked to photograph them and get their email so that I can send them an invite to the year-end celebration. Usually younger people are very comfortable with both of these requests, however, they preferred to stay more anonymous. They did allow me to take this one picture from far away…that’s them sitting at the table on the left. Well, I felt like I might have worn out my welcome a little and said goodbye. I do hope that they check out the blog and decide to come to the celebration in December. Time to head home before it rains. Day 167 – Giliante V.
For those of you who have not seen the video I posted yesterday about my life on the plantation in Colombia, check it out. Although totally different than my life here in DC, life there on the plantation was excellent. Are you ready for the Worldwide Day of Giving? It’s this Tuesday. It’s your chance to do what I do for one day and then share your story with the world. I want to collect as many experiences from around the world about giving that day and share them here…let’s make something beautiful happen. I need your help though to get as many people involved as possible. For those of you in DC, I am looking forward to actually meeting up on Tuesday evening with those who are interested. I am currently working out the final details with a local venue (Dupont Circle) and hope to host the event there. In addition to celebrating the Year of Giving and the Worldwide Day of Giving, we will do something to help those who are out of work in the Gulf region due to the oil spill. I hope you can join me! Sunday the 30th was election day in Colombia. I was excited to see how the election process took place in another country. Roberto Gonzalo’s sister was working at a polling place. He was voting at another place. It was pretty much like it is here. Voting levels are about the same as here I think, somewhere around 50% of the population voted. As I mentioned yesterday, the election resulted in two candidates going to a run-off election on June 20th. It’s widely believed that the Juan Manuel Santos will prevail. While I waited for Roberto Gonzalo to vote, I met Giliante. 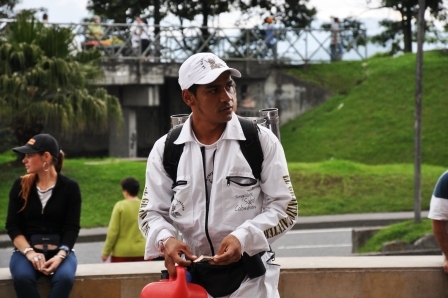 Giliante works for the El Gran Cafeteiro company and sells coffee on the street. Dressed in somewhat of a space suit, he walks the street with a metallic canister on his back filled with piping hot coffee. He then has a hand control that he dispenses coffee out of for about 25 cents per cup (he makes about six cents per cup). Check out Giliante in action preparing a coffee for me. The 34-year-old Manizales native has been doing this for nine months. It beats the construction jobs he was doing before. He enjoys the fact that he meets a lot of different people every day. I asked him what he would do with my 20,000 pesos and he said he would use it to buy some medicine he needed: flouxetina (prozac) and acido valproico (valproic acid). I had never heard of flouxetina and acido valproico so I asked what they were for. The educated and well spoken mobile coffee barista looked at me and said, “They are medicines to help me not get depressed, because when I get depressed I have a problem with cutting myself…with self mutilation.” It was then that I started to notice small scars on his hands and on the right side of his neck. He must have noticed me staring at them and said, “I have hundreds more…most of them on my arms and stomach.” He lifted his shirt up and I was stunned. His chest and stomach were completely covered with crisscrossed lines. It was impossible to look away from the center of his chest where a fresh-cut was present and maybe a half-dozen stitches protruded through the skin. Giliante was so calm and mild-mannered, I could not envision him doing this to himself. He said that when he does not take his medicine, he gets depressed and feels the need to cut himself. The latest cut happened about a week ago he told me. I asked to take a picture of his chest, but he got very shy and said he would prefer not to. I respected that and we said goodbye. Roberto Gonzalo then asked me what his answer was to my question about what other people might be able to help him with. I had not asked him that question though. I scanned the crowd, but he had dissolved into the sea of anxious voters. As we walked back toward our car, I hoped we would see Giliante again so that I could ask him how people could help him. Would you believe that about a half hour later we saw him five blocks from where I originally saw him. I got his attention and asked my question. He didn’t hesitate, “I would like to find a surgeon who would remove some of my scars for me. They are painful reminders.” I vowed to try to find a surgeon who would help him with that and also offered to try to get the medicine that he needs. He was so thankful. If anyone can help Giliante or has suggestions on ways to help him, please let me know. I couldn’t stop thinking about him for days. Para aquellos de ustedes que no han visto el video que publique ayer acerca de mi vida en las fincas en Colombia, échenle un vistazo. Aunque totalmente diferente a mi vida en DC, la vida allí en la finca fue excelente. ¿Estás listo para el Día Mundial del dar? Es este martes. Es tu oportunidad de hacer lo que yo hago por un día y luego compartir su historia con el resto del mundo. Quiero reunir la mayor cantidad de experiencias de todo el mundo de tratar de dar en ese día y compartirlas aquí… hagamos que algo hermoso suceda. Necesito su ayuda para conseguir el mayor número de personas que participan como sea posible. Para aquellos de ustedes en Washington DC, estoy deseando una reunión en la noche del martes con los que están interesados. Actualmente estoy trabajando en los detalles finales con una sede local (Dupont Circle) y espero poder realizar el evento allí. Además de celebrar el Año de Dar y el Día Mundial del dar, vamos a hacer algo para ayudar a quienes están sin trabajo en la región del Golfo debido al derrame de petróleo. Espero que pueda unirse a mí! El Domingo 30 fue el día de elección en Colombia. Me emocioné al ver cómo el proceso electoral se llevó a cabo en otro país. La hermana de Roberto Gonzalo estaba trabajando en un centro de votación. Él estaba votando en otro lugar. Fue más o menos como aquí. Los niveles de votación son casi lo mismo que aquí, creo que alrededor del 50% de la población votó. Como dije ayer, la elección dio lugar a dos candidatos a una segunda vuelta el 20 de Junio. En general se creía que Juan Manuel Santos seria el determinante. Mientras esperaba que Roberto Gonzalo votara, me encontré con Giliante. Giliante trabaja para la compañía El Gran Cafeteiro y vende café en la calle. Vestido el algo como un traje espacial, camina por la calle con un bote metálico en la espalda llena de café humeante. Luego el tiene un control de mano que le dispensa el café por unos 25 centavos por taza. El nativo de Manizales de 34 años de edad, ha estado haciendo esto durante nueve meses. De acuerdo a el es mejor que los trabajos de construcción que estaba haciendo antes. Le gusta el hecho de que se encuentra con un montón de gente diferente cada día. Le pregunté qué iba a hacer con mi 20.000 pesos y me dijo que lo utilizaría para comprar unas medicinas que necesitaba: flouxetina (Prozac) y ácido valproico (ácido valproico). Yo nunca había oído hablar de acido valproico y flouxetina así que le pregunté qué eran. El educado y bien hablado barrista móvil de café me miró y dijo: “Son medicamentos que me ayudan a que no me deprima, porque cuando me deprimo tengo un problema con cortarme mí mismo… con la automutilación.” Fue entonces que empecé a notar pequeñas cicatrices en las manos y en el lado derecho del cuello. Él debió de haber notado mi mirada fija en ellos y dijo: “Tengo muchas más… la mayoría de ellos en mis brazos y el estomago.” Él se levantó la camiseta y me quedé atónito. Su pecho y estómago estaban cubiertos completamente con líneas cruzadas. Era imposible apartar la vista del centro de su pecho, donde un nuevo corte estaba presente y tal vez una media docena de puntos sobresalían a través de la piel. Giliante estaba tan tranquilo y apacible, no podía imaginar que él hacia esto a sí mismo. Dijo que cuando él no toma su medicina, se deprime y siente la necesidad de cortarse. El último corte sucedió hace aproximadamente una semana, me dijo. Le pedí que me dejara tomar una foto de su pecho, pero él se puso muy tímido y me dijo que preferiría que no. Yo respete eso y nos despedimos. Roberto Gonzalo me preguntó cual fue su respuesta a mi pregunta sobre lo que otra gente puede ser de ayudarlo a él. No le había hecho esa pregunta. Lo busque entre la multitud, pero él se había disuelto entre la aglomeración de votantes ansiosos. Mientras caminábamos hacia el coche, yo esperaba ver a Giliante de nuevo para que yo pudiera preguntarle cómo la gente podía ayudarle. ¿Creerían ustedes que alrededor de una media hora más tarde lo vimos cinco cuadras de donde originalmente lo vi. Llame su atención y le pregunté mi pregunta. El no dudó: “Me gustaría encontrar un cirujano que eliminara algunas de las cicatrices en mi cuerpo. Ellos son un recordatorio doloroso. “Juré tratar de encontrar un cirujano que le ayudara con eso y también ofrecí tratar de obtener el medicamento que necesita. Estaba bastante agradecido. Si alguien puede ayudar a Giliante o tiene sugerencias sobre los medios para ayudarlo, por favor hágamelo saber. No podía dejar de pensar en él durante días. Encima hay dos videos de Giliante grabado en español. Este blog fue traducido generosamente por Nancy Alvarez en Los Angeles. Day 166 – Rubiela B. Version en espanol va ser publicado al final de jueves. On Friday Roberto and I decided to have a few beers at a local convenience store that has a TV, two billiard tables, and a few tables where locals can sit and relax. After our second beer some neighborhood kids asked if we wanted to play some street soccer. We agreed. Not only am I terrible at soccer, I was completely out of breath running back and forth on the gravel road that was our “field.” We are at about 7,000 feet which is about 6,990 feet higher than Washington, DC. That on top of the 24 ounces of beer sloshing around my stomach had me completely incapacitated. Thankfully Roberto played well and scored two or three goals for us while I rambled around wheezing. The next morning was Saturday and Roberto took me down the mountain to show me his plantation. He grows coffee, bananas, guavas, etc. and has pigs, chickens, turtles, dogs…you name it. Here is a short video in English about life on the plantation. Later that day he took me to his mother’s house where the entire family met for a long lunch filled with conversation about the following day’s presidential election. Most people in the household were supporting Antanas Mockus, however he ended up coming in second place with less than half of the votes of Juan Manual Santos. Nevertheless, there will be a run-off election between the two candidates on June 20th. We spent a few hours relaxing at their house after completely gorging ourselves with homemade soup, rice, beans, chicken, fried plantains and crunchy coconut clusters for dessert. That evening we stopped at a small food stand in front of a residential building in the Francia neighborhood where Rubiela stood stoking the charcoal fire. There was only one thing on the menu: arepas. 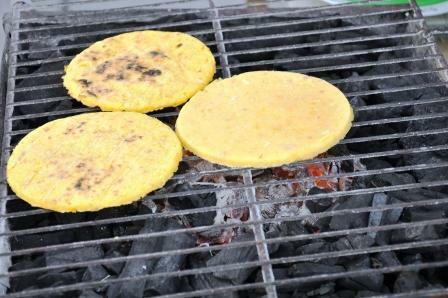 Arepa is a flat bread made of corn that is very popular in Colombia, Venezuela, and even parts of Panama and Spain’s Canary Islands. Picture a pancake-like bread…or maybe a really thick corn tortilla. Rubiela takes ground corn and mixes it with water, salt, and butter to make the dough. She then takes the dough, cooks it on the grill, and serves it with a thick tomato and onion stew (guiso) or cheese or both. Every day she makes at least 3 kilos of arepas which yields about 66 pieces of bread. I found that there are several varieties of arepas and that they are consumed just about any time of day. 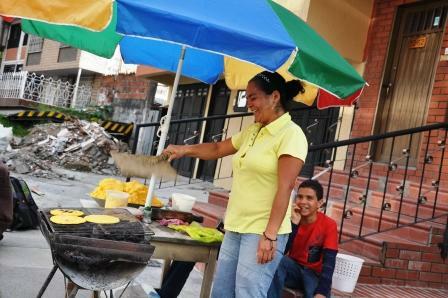 Rubiela, a single mom, has been firing up the grill in front of her home for seven years. This is the way she provides for her and her 12-year-old son Victor Manuel. “There was nothing else to do so I started selling arepas,” she tells me referencing the economic struggles in Manizales. She says that it is even hard to find a job as a maid, much less an office related job with benefits. Ideally she would like to work in an office environment where she could help with receiving guests, serving coffee, and other small tasks. Her laugh is contagious and fills the air with joy. I try not to let it completely hide the fact that I know that she dreams for something different. She is thankful though for her and her son’s health. “There are good days and bad days, but we never go hungry,” she tells me. Roberto and I left to run some errands and agreed to come back later that evening. When we returned hours later, the sun had set, her son had retired into their home, but Rubiela was still tending the fire and cooking arepas. Her hearty laughter had subsided and she was noticeably tired. We both got two arepas. I got mine topped with the tomato and onion guiso. Roberto got his with guiso and cheese. Each arepa with guiso was $0.40. If you wanted cheese on top, add another $0.60. Pretty cheap. They were delicious. We ate, laughed, and talked politics…hard to avoid with the election the following day. She was voting for Juan Manuel Santos, the candidate from the incumbent U Party. Rubiela said she was going to hold on to my money and put it toward the rent that is due on June 4th. Here is a short video of my time with Rubiela, part of it is in English part in Spanish.